My spring break started not too long ago. A full two weeks of freedom from the rigors of academia and college-age angst. While I’m happy to be able to sleep in, take showers without wearing sandals, and not have to sneak food out of my kitchen, I can already feel the boredom slowly creeping in. Part of the problem is that I am textbook Type A, which Google defines as, a personality type characterized by ambition, high energy, and competitiveness, and thought to be susceptible to stress and heart disease. Yeah, let’s go ahead and ignore that second part, if only to give me some peace of mind. The point I was trying to make is that I am always in need of a challenge; my hands must be kept busy. 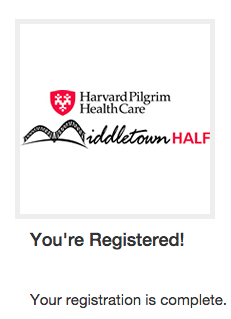 So, with all my friends off at college and the weather growing increasingly warmer, I thought there was nothing better to do than to sign up for the Middletown Half Marathon and start training. The only caveat: it’s five weeks away. This past weekend, I went on my first run in nearly six months. Surprisingly, it didn’t go terribly. I actually felt great. There was a great deal of huffing and puffing when it came to conquering hills, but overall, I finished those three miles with an average pace of 7:26/mile. Despite this initial good sign, I knew that I was altogether unprepared for the challenges that lay ahead. I decided to pay a visit to my old cross country coach and enduring mentor, Dan Inloes, for advice on how to conquer a half marathon in such a short period of time. Me and Dan after I received an award for doing something deemed important to the community. After first telling me to “take things slow,” Inloes proceeded to launch into a detailed plan that had me running about 25 miles a week in preparation for the big day. Beyond my weekly mileage, the most important part of my training will be my off-days. Inloes cautioned me against cutting out all physical activity on those days and insisted that I craft two strength training routines to maintain peak form. Each week will center on a long run on Sunday, followed by a lift on Monday, a hard run on Tuesday involving hills or a Fartlek run, an easier run on Wednesday, followed by a more uptempo run on Thursday or Friday, and a very easy run on Saturday. My two strength training routines will be relatively light duty compared to the barbell training that comprised my recent bulking phase. Given that Middletown is famed for its many hills, I am under no illusion that this will be my half marathon PR. Nonetheless, I am still aiming for a time of 1:45:00 and am sure that it’ll be a rewarding day!